Professional air ventilator, water tank, cooling tower, frp lab equipment manufacturer in China. Shuangyi Environment Engineering Co., Ltd., is a large modern enterprise which integrate technology, industry and trade, mainly produce the FRP products, which including: FRP cooling tower, air ventilator, water tank, ventilation pipes, winding pipe and tank, central air conditioning terminal equipment, engineering installation, pipes, butterfly valve, ball valve, globe valve, and other FRP products, etc. Our company is based on the abundant strength, exquisite technology, advanced management, pioneering spirit, always adhere to the management guideline "focus on the market, achieve dependig on qualiy, innovation and development", constantly pioneer to develop, and built the brand-new enterprise image. Our company has advanced equipment and we are honored as "Provincial Contract Trustworthy Enterprise" by Shandong Province Government. We have passed the authentication of Switzerland SGS, ISO9001 International Quality System and ISO14001 Environmental Management System certifications. We boast solid capital strength, superb technology and advanced management, and we always abide by the principle of "based on the market, winning with quality, innovation and development". We continue to develop and hope to establish a new corporate image. General Centrifugal FanS4-72-11 centrifugal ventilators are suitable for petroleum, chemical industry, metallurgy, electroplating, sewage treatment, brewing, textiles, electronics and other areas. ZHT-35 Axial fanModel ZHT-35 axial flow fan has streamlined outline, elegant appearance and proven rigidness. It features rigid fan blades and a uniform fan hood. SWF Type Mixed Flow Ventilator SWF type mixed flow ventilator is widely used in industrial and civil construction of ventilation and air conditioning systems. Direct Drive Wall Mount Exhaust Fan It is used for ventilation in industrial and mining enterprises, civil construction, stadium, animal husbandry, various entertainment. Double Iinlet Centrifugal Ventilator Double inlet centrifugal ventilator is a new, energy-saving, high efficiency, variable speed, low noise centrifugal fan. DBNL3 Normal Type Cooling TowerThe new designed DBNL3 cooling tower water distribution and the flow field very uniform reached the best overall performance. SMC Combined Water TankSMC combined water tank is the fresh type water tank which is widely using in the world, it is combined by the SMC panel. Assembled Hot Dipped Galvanized Steel Water TankAssemble hot dipped galvanized water tank is produced according to the 92SS77. Fume Hood Fume hood is a kind of high efficiency device specially designed for using in laboratories frequently. 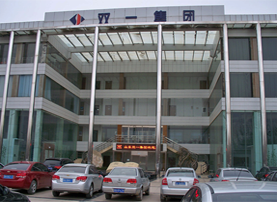 Lab Bench Shuangyi is committed to lab equipment design, development and research. Cylinder Air Vent Air vent belongs to the ventialtor designed by use of the principle that wind push the vent to rotate and inside and outside air exchange. Butterfly DamperThe butterfly damper can be used for the ventilation pipe, for adjustting or cutting off the air flow. 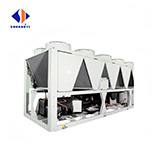 Air Cooled(Heating) Chiller Unit It is one of the series of central air conditioning products which developed by Shuangyi group who bring in advanced technology from European and American countries. 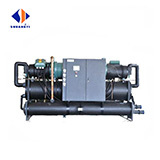 Water Cooled ChillerThis unit is designed and manufactured strictly according to the national standard. 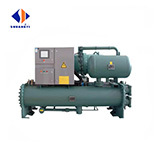 We adopt high quality and efficiency compressor, refrigerant system control element and the computer control device produced by famous manufacturers. LM Full Liquid Type Water Cooled Chiller Series LM series full-liquid water cooling chiller is one of the series of central air conditioning products which developed by Shuangyi group who bring in advanced technology from European and American countries. 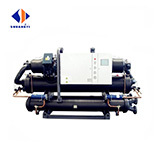 Ground Source Heat Pump UnitIt's also called ground source central air conditioning. It use the solar energy stored in the earth as a heating and cooling air conditioning system for energy conversion.